Now on exhibit at the Art Gallery, i.e. vistas explores the heritage, landscape, memory, and reality of the communities that make up the Inland Empire. Running through Feb. 15, i.e. vistas is the collaborative effort of artists Juan Delgado and Thomas McGovern, known collectively as JUANANDTOM. Together, they combine the written word with images, and i.e. vistas features the photography of McGovern and poetry of Delgado. Visitors will recognize Yucaipa, Redlands, Corona, and other local cities in their work. This is an interactive exhibit, Crafton Hills College Professor of Fine Art Renée Azenaro says, inviting people "to consider the neighbors and neighborhoods which surround them." QR Codes are provided for the art, where visitors can listen to narrative about the specific piece. The audio is also posted online at juanandtom.com. McGovern and Delgado are longtime collaborators, and their book Vital Signs received an American Book Award in 2014. 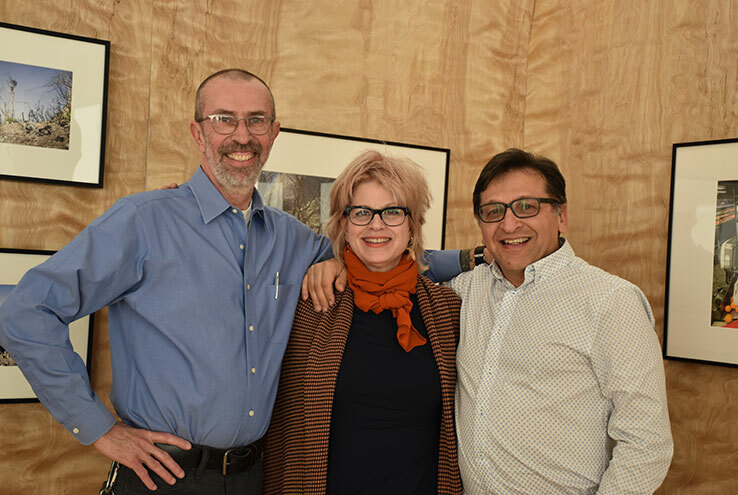 They are also both professors at California State University, San Bernardino — McGovern is a professor of art, while Delgado is a professor of English and director of the MFA program in creative writing. Because many of CHC's students transfer to CSUSB, and it's also where several faculty and staff members earned their degrees, this was a "natural connection I wanted to explore and bring to Crafton," Azenaro says. "The artists' work is created through collaboration, is about community, and combines art forms which opens creative avenues for our students." By coming to see i.e. vistas, visitors are not only supporting local artists, but also learning more about the world around them. "Experiencing artwork in a gallery offers visitors new perspectives and is a space that is welcoming, educational, visceral, and thought provoking," Azenaro says. The Crafton Hills College Art Gallery is located in the Learning Resource Center. Gallery hours are Monday-Thursday, 10 a.m. to 2 p.m., but it’s best to confirm first by calling 909-389-3353.